THE youngest candidate in the coming polls received the rockstar treatment on her first walkabout after being unveiled as a candidate last week. Heads turned and crowds formed when the National Solidarity Party (NSP)'s Nicole Seah, 24, visited two wards in Marine Parade GRC with her four teammates on Sunday. Over 15 members of the public who found out about the walkabout from Ms Seah's Facebook page turned up dressed in orange to show their support. Ms Seah has captured the attention of many online, with comparisons being made between her and the People's Action Party (PAP)'s own youngest candidate, 27-year-old Tin Pei Ling. Ms Tin, who has been criticised for appearing immature in interviews, is likely to stand in Marine Parade GRC led by Senior Minister Goh Chok Tong. On Saturday, SM Goh spoke about implementing a buddy system where the more experienced MPs would partner the new candidates at their meet-the-people sessions. Incumbents Fatimah Lateef and Seah Kian Peng would 'buddy' new faces Ms Tin and former army general Tan Chuan-Jin respectively. 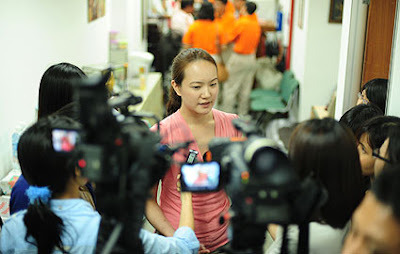 NSP president Sebastian Teo said this was an attempt by the PAP to divert attention from Ms Tin. 'I think they are just trying to avoid a one-to-one straight competition, that's why they are putting two in one pair... They are trying to divert focus from their young candidate,' said Mr Teo.